Business is a lot like poker. There are very few times when you should put everything in the middle. About a week ago I was a guest on a new podcast, EntrePop. I’ve been a guest on a few podcasts over the years and I was really looking forward to this one. I listened to past episodes and really thought it was neat to learn about business from stories, but also about the interests of entrepreneurs. The host, Jonathan Mills, commented to me that he liked the idea of looking at the interests of entrepreneurs just as people on a more personal side. Things like music, movies and books are usually things that affect everyone’s lives. And we can find interesting connections or discover new things by hearing about how other people view pop culture. You can’t lose what you don’t put in the middle. But you can’t win much either. It’s Rounders with Matt Damon and Edward Norton. Back around the 2000s I was on a Matt Damon movie kick. I think it came about as a result of the first Bourne movie. I bought a few of the archive DVDs of movies that Damon was in and that included 1998’s Rounders. This had to be at least 2-3 years before Chris Moneymaker won the World Series Of Poker and everyone became poker crazy. Anyway, I must have watched Rounders dozens of times. There was just something really cool about the story. It was about the life of a poker player – the ups and downs – the idea of putting it all on the line and almost becoming trapped in something that you’re so good at even if you’re not sure it’s the thing you should be doing. And the line about not being able to win much if you don’t put anything in the middle always stuck with me. I even put it in the graduation program (or yearbook) when I graduated high school in 2003 under my name. In those days I interpreted the line a little different. I thought it meant that you had to take huge risks in life. Today I look at it a little differently. Very rarely do successful businesspeople take risks that can ruin them; I mean truly ruin them. They almost always leave themselves some kind of out. That’s actually a lesson I didn’t pick up on early with Rounders. 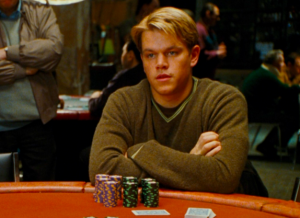 The movie is basically about Matt Damon’s character learning that you have to take calculated risks in life. There is a difference between taking risks for the sake of taking risks and taking risks when you trust judgment, your preparation and your skill. When you first start a business you take a jump. You have to. The outs you leave yourself is that you can always get another job. You try not to take on huge debt that you can’t repay even if you go under in a few months. Later in business it’s still important, and perhaps more important, to take calculated risks. Now you have something valuable (your business) and you can’t risk it all on hunches or every opportunity that comes along. But you have to be able to prepare for changes and to know the right opportunities when they come along and even still leaving yourself an out if it all fails. I like to read as much as I can and that includes industry news articles and trends. For Ghost Blog Writers, that means marketing articles, blogging articles, content marketing articles, SEO articles, social media articles and so on. There are plenty of opportunities out there if you read. Many of those opportunities will be bad. Many will be good. But only a few will be ones that you should take. The first step is opening up your world to opportunity. You can’t take them if you don’t watch for them. The next step is assessing them. Each situation is different, but basically you have to look at the opportunity and assess if you can do it profitably. There is no harm in doing a little project; running the numbers. This means estimating what it would cost you to do something under what you could charge and looking at the long-term potential growth. The other side is assessing the risk. There are a number of risks including competition, industry changes, regulation, game-changing innovation and your investment. If you change your business or start a new business there will be an investment of time and money. It’s okay to ease into new opportunities to see how they might go. But going full bore into something puts a heavier burden on your life and that’s when things can go haywire. Think of Matt Damon’s character in Rounders and his inspiring quote. Don’t jump into something until you’ve tested its viability. Leave yourself outs. Have patience. When the time is right, put your chips in the middle and go for it. When you start seeing life in the new opportunity that is the time to place the big bet and go for it.